Whenever a layer of composition is being added or an entire roof replacing is be done, there are some important considerations. First, your siding, gutters & downspouts all compose an entire drainage system. So not only should the roof be inspected for damage, wear and current condition but the others as well. Details like loss of granularity on asphalt shingles should be addressed, as should expected remaining life. Flashing is a common weak point in the system. View all drip edge and flashing around the gutters, chimney brick step-flash as well as the siding underflash. Many roofers avoid the more difficult chimney step-flash that is sunk in mortar - applying sealants here may bring only a fix that hangs on hope. Determine if a cricket should be installed to divert water drainage by the chimney. Note that re-flashing, and the replacing of vent seals is best done during a complete tear off, when all is exposed. The vent boots are common to fail at the pipe - the ideal fix is to install new vent seal units although there are alternatives. The tear off will expose decking which is in need of replacement and this can be inspected in advance, from the attic. Ventilation should be addressed, particularly on older roofs. Measures do need to be taken to help ensure proper air circulation, preferably by a calculated method. This can not only help promote healthier electric bills but will preserve your roof in the long run. The cooler attic means shape retention of the sheathing, and less warping due to heat buildup. Look in to the possibilities of a ridgeline vent - that are available to match existing composition shingles, these will help to unclutter the roof surface but adding them could also mean patches on the decking when pulling the prior vents, and, depending on your roof, other kinds of ventilation could be more efficient like actuated units to really push the hot air out. Eave vents should have sufficient intake for attic ventilation. Steep pitch roofs are jobs for professional roofers, not amateurs, even given the recommended support, such as nailing in roof jacks. With this comes risk of serious injury. Almost all roofers are aware of just what is walkable and what is not. Never be on the roof when the temperature is hot - this causes the roof surface to soften and poses unnecessary risks to the roofer. Patches for flashing or roofing that is damaged, worn or missing roofing is usually an indicator the the rest of the roof is in need of work. A rule of thumb is that if greater than 10% of the surface requires repair, chances are that replacing is preferred. Although adding a layer is economically enticing, building codes commonly specify the number of asphalt layers - in certain locations, a single layer only. Also, an effect of having too many layers is that nail grip and support is lessened, heat holds and intensifies, and loads increase across the rafter spans (maximum limits should not be exceeded). Additionally, layers should not be attempted over certain thicker, high profile shingles. Never wait for the roof above to begin leaking to start looking into adding or changing your roof. Once water & moisture permeates the wood decking, further damage is being caused combined with moisture in the insulation, drywall and ceiling areas, potentially bringing mold along with it. If you have asbestos roof shingles (some felt materials also contain asbestos) have a team of qualified professionals assess the situation. Get more information at Asbestos Roofing Products from mesothelioma.com. Make an effort at roof maintenance by cleaning it when needed and also the gutters and downpouts, to prevent blockage backups. Lastly, become well informed about the best types of materials to be used that will suit your tastes and provide service with a safe install #1. 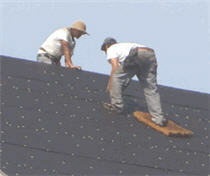 Offers ideas on prospective roofers when you are setting out to find them. Price quotes for the roof will vary substantially based on the materials and roof style, and the chosen contractor along with a number of other factors. For a scoping on the roofing estimate and items of interest. Breaks down prices for cleaning the roof by roofing companies and also doing yourself. Views related pricing concerns and factors that can amount to extra fees. Roof Decking - Plywood Delamination About the case of aged structures and encountering delaminating plywood under the roof surface. Provides a list of proven tactics for when replacing the roof.